Samothrace is a very unique Greek island in the northeastern part of the Aegean Sea. It is bordered to the north by the Thracian Sea and belongs administratively to the region of Evros. Its distance from Alexandroupoli is 24 nautical miles (about two hours by ferry), it has a total area of ​​178 square kilometers and a population of approximately 2,840 residents. Samothrace in ancient Greek means “High Thrace” (samos = tall, high), as Feggari, the highest peak of mountain Saos has an altitude of 1610 meters. Kamariotissa is the port of the island, situated on the northwestern tip, and is also one of the major settlements of Samothrace, along with Chora, Therma and Alonia. Samothraki has beautiful beaches, most of which are not accessible by road, with turquoise waters and one of the richest seabeds of the Mediterranean. 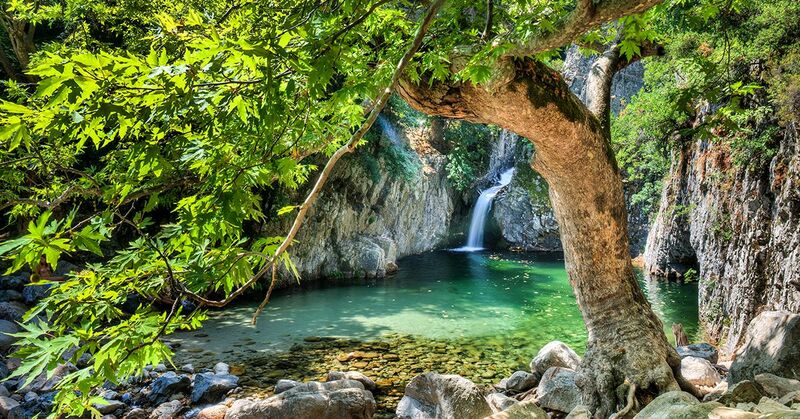 The verdant landscapes of Samothrace are what makes the island unique: wild nature, dense vegetation, and abundant springs. You will also see goats in the middle of nowhere, as a large number of them live in the wild in the mountains of the island. Brooks and streams that originate from mountain Saos, on their way to the sea often form waterfalls, as well as vathres, which resemble natural pools in the rocks and will surely entice you to dive into their icy, crystal waters. Apart from its natural beauty, Samothrace has a rich history and is of huge archaeological interest. The world famous statue “Nike of Samothrace ” was discovered on the island in 1863 and today is one of the most important exhibits in the Louvre, in Paris. The “Cabeiri Mysteries” that took place in ancient times in the Sanctuary of the Great Gods of Samothrace, were one of the occult rites of the ancient Greeks. At much later times, with the fall of Constantinople to the Crusaders, Samothrace fell into the hands of the Franks Gattilusi, who fortified the island with towers and walls, which are preserved until today. Come to Samothrace, this unique island that will enchant you with its secrets, which you will never get tired discovering!